The director of the experiment, Art McDonald, was co-awarded the Nobel Prize in Physics in 2015 for the experiment's contribution to the discovery of neutrino oscillation. The underground laboratory has been enlarged into a permanent facility and now operates multiple experiments as SNOLAB. The SNO equipment itself is currently being refurbished for use in the SNO+ experiment. In 1984, Herb Chen of the University of California at Irvine first pointed out the advantages of using heavy water as a detector for solar neutrinos. Unlike previous detectors, using heavy water would make the detector sensitive to two reactions, one reaction sensitive to all neutrino flavours, the other reaction sensitive to only electron neutrino. Thus, such detector can measure neutrino oscillations directly. A location in Canada was attractive because Atomic Energy of Canada Limited, which maintains large stockpiles of heavy water to support its CANDU reactor power plants, was willing to lend the necessary amount (worth C$330,000,000 at market prices) at no cost. The SNO collaboration held its first meeting in 1984. At the time it competed with TRIUMF's KAON Factory proposal for federal funding, and the wide variety of universities backing SNO quickly led to it being selected for development. The official go-ahead was given in 1990. The experiment observed the light produced by relativistic electrons in the water created by neutrino interactions. As relativistic electrons travel through a medium, they lose energy producing a cone of blue light through the Cherenkov effect, and it is this light that is directly detected. The SNO detector target consisted of 1,000 tonnes (1,102 short tons) of heavy water contained in a 6-metre-radius (20 ft) acrylic vessel. The detector cavity outside the vessel was filled with normal water to provide both buoyancy for the vessel and radiation shielding. The heavy water was viewed by approximately 9,600 photomultiplier tubes (PMTs) mounted on a geodesic sphere at a radius of about 850 centimetres (28 ft). The cavity housing the detector was the largest in the world at such a depth, requiring a variety of high-performance rock bolting techniques to prevent rock bursts. The observatory is located at the end of a 1.5-kilometre-long (0.9 mi) drift, named the "SNO drift", isolating it from other mining operations. Along the drift are a number of operations and equipment rooms, all held in a clean room setting. Most of the facility is Class 3000 (fewer than 3,000 particles of 1 μm or larger per 1 ft3 of air) but the final cavity containing the detector is an even stricter Class 100. In the charged current interaction, a neutrino converts the neutron in a deuteron to a proton. The neutrino is absorbed in the reaction and an electron is produced. Solar neutrinos have energies smaller than the mass of muons and tau leptons, so only electron neutrinos can participate in this reaction. The emitted electron carries off most of the neutrino's energy, on the order of 5–15 MeV, and is detectable. The proton which is produced does not have enough energy to be detected easily. The electrons produced in this reaction are emitted in all directions, but there is a slight tendency for them to point back in the direction from which the neutrino came. The existence of neutrinos is inferred from the energies of the electron. If the transition of the neutron to the proton were classical, then there would be a single electron energy transition in the weak decay, a delta function. However, a curve is observed, the Fermi-Curie plot. Thus, the process exhibits three body dynamics. There is, likely, a theory involving the rotation of the liquid drop model of the inertia of the neutron, where its charge density blebs into an electron forcing a causality violating up down quark transition. Covariant rotational energies of both the proton after neutron during beta decay could cause the electron spectrum without need for a neutrino. In the neutral current interaction, a neutrino dissociates the deuteron, breaking it into its constituent neutron and proton. The neutrino continues on with slightly less energy, and all three neutrino flavours are equally likely to participate in this interaction. Heavy water has a small cross section for neutrons, and when neutrons capture on a deuterium nucleus a gamma ray (photon) with roughly 6 MeV of energy is produced. The direction of the gamma ray is completely uncorrelated with the direction of the neutrino. Some of the neutrons wander past the acrylic vessel into the light water, and since light water has a very large cross section for neutron capture these neutrons are captured very quickly. A gamma ray with roughly 2.2 MeV of energy is produced in this reaction, but because the energy of the photons are not above the detector's energy threshold (meaning above the threshold for the photomultipliers), they are not directly observable. The gamma ray collides with an electron through Compton scattering and the accelerated electron can be detected through Cherenkov radiation. In the elastic scattering interaction, a neutrino collides with an atomic electron and imparts some of its energy to the electron. All three neutrinos can participate in this interaction through the exchange of the neutral Z boson, and electron neutrinos can also participate with the exchange of a charged W boson. For this reason this interaction is dominated by electron neutrinos, and this is the channel through which the Super-Kamiokande (Super-K) detector can observe solar neutrinos. This interaction is the relativistic equivalent of billiards, and for this reason the electrons produced usually point in the direction that the neutrino was travelling (away from the sun). Because this interaction takes place on atomic electrons it occurs with the same rate in both the heavy and light water. On 18 June 2001, the first scientific results of SNO were published, bringing the first clear evidence that neutrinos oscillate (i.e. that they can transmute into one another), as they travel in the sun. This oscillation in turn implies that neutrinos have non-zero masses. The total flux of all neutrino flavours measured by SNO agrees well with the theoretical prediction. Further measurements carried out by SNO have since confirmed and improved the precision of the original result. Although Super-K had beaten SNO to the punch, having published evidence for neutrino oscillation as early as 1998, the Super-K results were not conclusive and did not specifically deal with solar neutrinos. SNO's results were the first to directly demonstrate oscillations in solar neutrinos. This was important to the standard solar model. The results of the experiment had a major impact on the field, as evidenced by the fact that two of the SNO papers have been cited over 1,500 times, and two others have been cited over 750 times. In 2007, the Franklin Institute awarded the director of SNO Art McDonald with the Benjamin Franklin Medal in Physics. In 2015 the Nobel Prize for Physics was jointly awarded to Arthur B. McDonald, and Takaaki Kajita of the University of Tokyo, for the discovery of neutrino oscillations. The SNO detector would have been capable of detecting a supernova within our galaxy if one had occurred while the detector was online. As neutrinos emitted by a supernova are released earlier than the photons, it is possible to alert the astronomical community before the supernova is visible. SNO was a founding member of the Supernova Early Warning System (SNEWS) with Super-Kamiokande and the Large Volume Detector. No such supernovae have yet been detected. The SNO experiment was also able to observe atmospheric neutrinos produced by cosmic ray interactions in the atmosphere. Due to the limited size of the SNO detector in comparison with Super-K the low cosmic ray neutrino signal is not statistically significant at neutrino energies below 1 GeV. Although no longer a collaborating institution, Chalk River Laboratories led the construction of the acrylic vessel that holds the heavy water, and Atomic Energy of Canada Limited was the source of the heavy water. Asteroid 14724 SNO is named in honour of SNO. In November 2006, the entire SNO team was awarded the inaugural John C. Polanyi Award for "a recent outstanding advance in any field of the natural sciences or engineering" conducted in Canada. SNO principal investigator Arthur B. McDonald won the 2015 Nobel Prize in Physics, jointly with Takaaki Kajita of Kamiokande, for the discovery of neutrino oscillation. SNO was awarded the 2016 Fundamental Physics Prize along with 4 other neutrino experiments. ^ "2015 Nobel Prize in Physics: Canadian Arthur B. McDonald shares win with Japan's Takaaki Kajita". CBC News. 2015-10-06. ^ Chen, Herbert H. (September 1984). "Direct Approach to Resolve the Solar-Neutrino Problem". Physical Review Letters. 55 (14): 1534–1536. Bibcode:1985PhRvL..55.1534C. doi:10.1103/PhysRevLett.55.1534. PMID 10031848. ^ a b c "The Sudbury Neutrino Observatory – Canada's eye on the universe". CERN Courier. CERN. 4 December 2001. Retrieved 2008-06-04. ^ "Heavy Water". 31 January 2006. Retrieved 2015-12-03. ^ Jelley, Nick; McDonald, Arthur B.; Robertson, R.G. Hamish (2009). "The Sudbury Neutrino Observatory" (PDF). Annual Review of Nuclear and Particle Science. 59 (1): 431–65. Bibcode:2009ARNPS..59..431J. doi:10.1146/annurev.nucl.55.090704.151550. A good retrospective on the project. ^ Brewer, Robert. 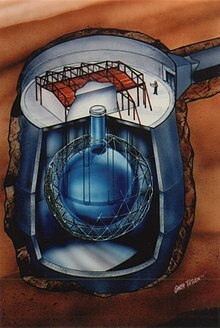 "Deep Sphere: The unique structural design of the Sudbury Neutrinos Observatory buried within the earth". Canadian Consulting Engineer. ^ Ahmad, QR; et al. (2001). "Measurement of the Rate of νe + d → p + p + e− Interactions Produced by 8B Solar Neutrinos at the Sudbury Neutrino Observatory". Physical Review Letters. 87 (7): 071301. arXiv:nucl-ex/0106015. Bibcode:2001PhRvL..87g1301A. doi:10.1103/PhysRevLett.87.071301. PMID 11497878. ^ "Sudbury Neutrino Observatory First Scientific Results". 3 July 2001. Retrieved 2008-06-04. ^ "Arthur B. McDonald, Ph.D". Franklin Laureate Database. Franklin Institute. Archived from the original on 2008-10-04. Retrieved 2008-06-04. ^ "The Nobel Prize in Physics 2015". Retrieved 2015-10-06. ^ "Past Winners – The Sudbury Neutrino Observatory". NSERC. 3 March 2008. Retrieved 2008-06-04. "Experiment Cave". WIRED Science. Episode 104. 2007-10-24. PBS. Written and Directed by David Sington (2006-02-21). "The Ghost Particle". Nova. Season 34. Episode 3306 (607). PBS. Showcase of Canadian Engineering Achievement: Sudbury Neutrino Observatory (IEEE Canada). Several articles about the civil engineering of SNO.